The UK media and telecoms regulator, Ofcom, produces an annual report surveying the global media and telecoms market. It's full of fascinating international comparisons - I've extracted some of the ones that caught my eye here. Lots and lots of interesting data in Ofcom's annual consumer attitudes report for the UK market. As ever, not all of this data can be read across to other markets, but I've posted a few of the charts that immediately caught my attention below. More extrapolation from Google IO numbers, this time looking at tablets. Google gave two 'charts' on this topic, shown below. In addition, Google's developer dashboard gives a breakdown of active Android devices by screen size: in the first week of July they accounted for 12.6%, not including phablets. And since Google also, for the first time, told us the active base, 'over 1bn', we can calculate an active tablet base of at least 126m devices, rising to 138m if we take 'over 1bn' as 1.1bn. 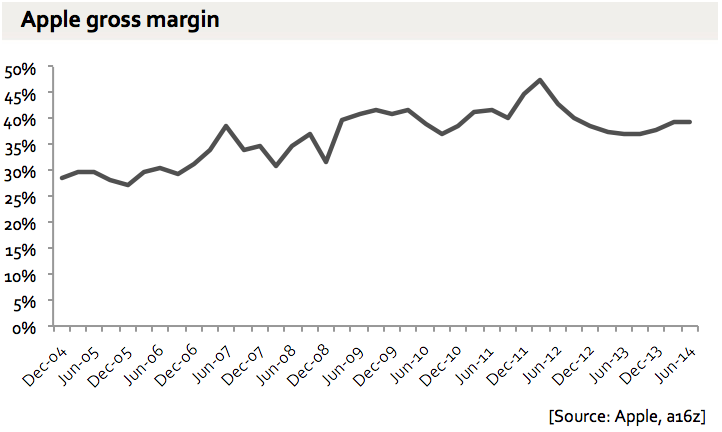 Apple, almost uniquely in the market, reports tablet sales and shipments. In the last 12m (which I presume that "62% in 2014" bubble refers to) iPad shipment were 69.7m and sales were 73m. If Android tablets indeed had 62% of sales (the chart isn't clear if it refer to sales or shipments) then that would equate to a market of 192m units and 119m Android tablets sold in the last 12 months. This would imply that Android tablets have an average active life of a little under a year. Or, that they have a life of more like two years (say) but half of them are inactive. Conversely, it's pretty clear that the active life of an iPad is if anything too long, from Apple's point of view - at least two years and probably longer. Apple has sold 143m iPads in the last two years and 196m in the last three. That, in turn, implies that each iPad unit sale is worth 2x more active devices over time than an Android tablet sale - before looking at actual usage. There are, though, two problems with this data. The first is that it's not clear if that 'Android tablets market share' includes AOSP tablets in China, where the vast majority Android devices have no Google services and hence do not show up in Google's active user figure or the developer dashboard screen size breakdown. Sundar did say that this doesn't include Kindle and other Android variants, which would add 'a few percentage points'. So it probably doesn't attempt to include China. The second is that it appears that a very large number of cheap Android tablets are used mostly or entirely offline, consuming video via SD card and playing games. So those might not be in Google's MAU data either. A year ago, Google gave a more explicit set of numbers for Android tablet sales, in the chart below. If you eyeball the numbers, that equates to 50m tablet activations (i.e. not AOSP) in the 12m to July 2013. 50m tablet activations in that 12m period compares to 70m iPad sales in the same period (more or less), giving a total market (excluding AOSP) of 120m units and Android a market share of 41%, which is probably close enough to the cited 46%. Activations in the previous 12m look like about 15m: Apple did 53m, giving Google Android a market share of 22%, though, not 39%. Something has got lost in those numbers somewhere along the way. One more thing. Google's internal data on tablets activations and device screen sizes is self-reported by the devices when they access play, using the Android screen profiles described here. But devices that are on the margin between two buckets can and do change what category they report from region to region and from one software update to another. This is a particular issue for phablets, where it's really a matter of opinion whether you should tell an app this is a normal or large screen, and whether it's xhdpi or xxhdpi. This, incidentally, is one reason why I sometimes mark shares of tablet sales with terms like 'approximate'. Finally, of course, all the available usage data of tablets shows iPads with around three quarters of total use, even in China. How long do Android phones last? For the first few years of its life, Google gave two types of number for Android: cumulative activations and daily activation rates. They tended to give them at scheduled events and they tended to give round numbers, so the precision was always pretty unclear, and sometimes the daily rate was not reconcilable with the increase in activations, but you had a pretty good sense of the rate of sales, as charted below (note the wonkiness of the data points). The last time a daily rate was given was in May 2013 (1.5m a day), and the last number for cumulative activations was in September 2013 (1bn). After that, dead silence until Google IO, when we got this chart, with a completely different set of metrics. The last bar represents 1bn monthly active Android users. This of course excludes China, where Android devices do not use Google services. We've all rather focussed on the growth rate and the 1bn MAU number, but it's very interesting also to go back and compare the two data sets. The dates don't always match exactly, and the numbers are rounded, but you can still get a good sense of how things line up. In June 2011 there were 77m MAUs. In May Google reported 100m cumulative activations and 160m in August. So maybe 130m is the comparable activation number. The first Android phone, the HTC G1, went on sale at the end of 2008, two and a half years earlier, but sales didn't really pick up until 2010: in February Google announced a 60k daily activation rate, which equates to 22m a year, and if you model it out it's very clear almost all the sales were after that. Hence, half of the Android phones activated in the 2.5 years or so after Android went on sale remained active at the end of that period, but arguably, half of those sold in the last 18 months (i.e. from the beginning of 2010). Now, let's look at the next year. In June 2012 there were 223m MAUs (+146m) and at roughly the same time, cumulative activations were 400m: 270m activations in the year it we take that 130m number from mid-2011. So, it looks like the average life of an Android phone at that point was less than one year (i.e. more phones were sold in the year than were in use at the end of it), compared to a two year average in the phone industry. Next, in June 2013 there were 538m MAUs (+315m), and 900m cumulative activations by May. So, a bit over 500m activations in the year, and roughly a 1 year life span. Finally, in June 2014 there were 1bn MAUs (+460m). Google has not given an activation number: most estimates of sales in the previous 12 months group around 750m. So it's opening up, a little. By this point tablets have become a material part of the Activations, which they were not in previous years, further opening up the cycle, though we have not had solid numbers from Google here in a long time. What should we make of this? These are (to repeat) approximate numbers, but it seems clear that Android phones remain in use for well below the 24m average for the market, and during the peak growth period the replacement rate was closer to one year. The chart below compares what a 24m replacement cycle would have looked like compared to Google's own numbers. The cycle clearly seems to be lengthening, but it's not clear yet how much. Meanwhile, we don't have comparable data for iPhones, but the fact that around a third of the active base is on the iPhone 4 or 4S does rather speak for itself: if anything the iPhone is on longer than 24 months, especially if you take 2nd hand into account (though quite a lot of that second-hand seems to be exported to emerging markets, complicating the picture). This has some interesting ecosystem implications. It looks like the Android ecosystem has to sell significantly more phones than Apple to get the same number of active users. This is probably good for the OEMs (presuming the replacements are not people switching away from Android to iPhone), but less good for Google. Ironically, Apple might prefer it to be the other way around as well - it would probably prefer you buy a new phone every year. But this makes comparing market share problematic - it looks like a given number of iPhone unit sales might mean more customers than the same number of Android unit sales. There's a multiplier effect here, too: the other data set we gained from Google IO was revenue paid to developers. We now know that in the last 12 months Google paid out roughly half as much as Apple (link). These ecosystems are just not the same. If this seems confusing and opaque, you're catching on.